E & R's Travels: Friday was a Great Day!! Here we are parked up at our lot for the next month. It was a great day yesterday-we were in shorts and tees :) and of course 'flops' for me. Rick worked on getting my palm tree to light up-thanks hon...I do love my tacky palm tree-we played shuffleboard in the afternoon with Dee and Jim, and Ken and Debbie, we had quite a few laughs and it was fun. We came back here to our place for happy hour and had quite a few more laughs. 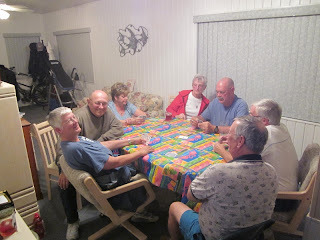 After supper we went with Dee and Jim to Jon and Kathleen's summer home here in the resort to play cards. We also met Pat and Dennis. What a great evening of fellowship-of course I forgot my camera.So I am swiping some from Dee's shots. I found the shuffle board was quite a bit like curling..so we pick up on the basics really fast-now to get the strategy in place. We tried to learn euchre-very interesting game! As well as chase the ace-and another one called 3-13 which boggled my mind. We had alot of laughs and made some new friends!! Thanks to Pat, Dennis, Jon and Kathleen for their wonderful hospitality and their top notch patience in the teaching department. It is shaping up to be another nice day here at the resort. 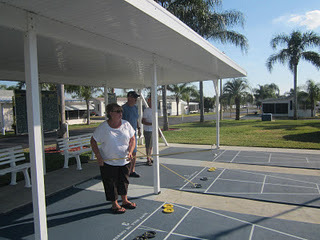 I think maybe shuffleboard will be in the works this afternoon. Firstly tho our furkids need a bath so thats first on the agenda. Have a great day everyone and be safe out there!! I have to say that your palm tree looks very familiar. Yes they are tacky, but I love them. Just settling if for a good time, great weather and new friends, love it. You should never forget your camera, shame on you! Good to hear you got the short and flip flop weather back. Looks like a fun resort to be at and with a nice group of people. Have another fun day. I have always wanted a palm tree like that for home but couldn't find one. Love that you are relaxing with friends. Your spot looks lovely! Being originally from Ohio, Euchre is our state card game. We don't run into too many people that know how to play it. 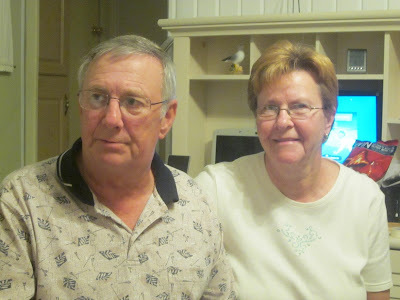 Glad you're having such a wonderful time... Dee & Jim are really nice people and hopefully we will get to hook up with them for lunch one day soon. Would be nice to meet you too so maybe we can all get together! That looks like a nice roomy site and you seem to be having a great time. That's all good!!! Isn't it nice wondering what you want to do? 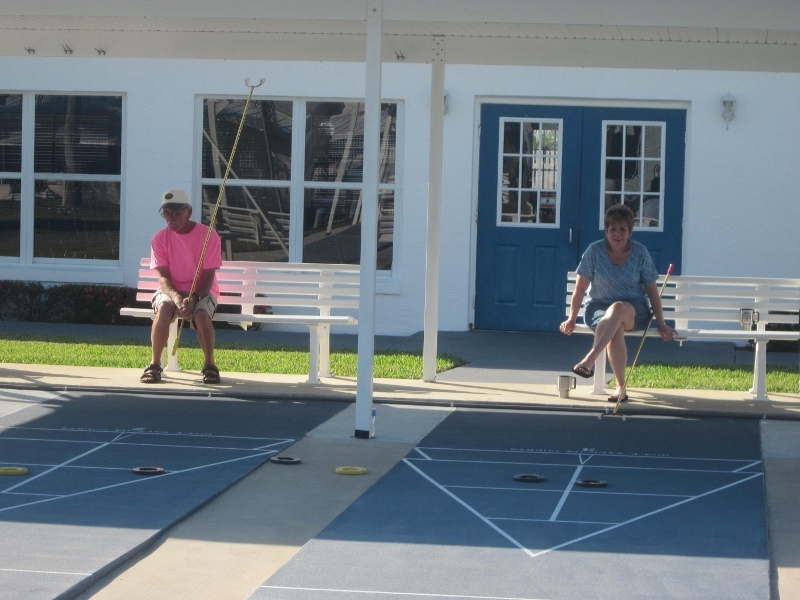 Shuffleboard, cards, wash the furkids..too nice! flip flops in January!..how great is that!!! Nice to see you've finally thawed out. Enjoy those flip flop days! That looks like a very nice site and plenty roomy. That site is huge!! Enjoy your month there.